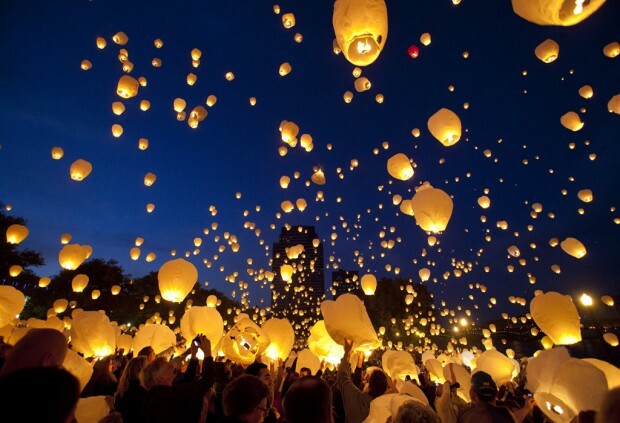 Lanterns fill the sky in downtown Grand Rapids, Mich., as part of "Lights in the Night" during ArtPrize, an open art contest. Thousands of people took part Friday. PRESCOTT - Sam Steiger, who served five terms as an Arizona congressman in the 1960s and 1970s, has died. He was 83. Steiger died Wednesday in the Northern Arizona town of Prescott, according to Yavapai County Supervisor Carol Springer. Steiger had been absent from the political scene since suffering a stroke in September 2002. He served five terms in the U.S. House of Representatives, two terms in the Arizona Senate in the early 1960s, and one term as Prescott's mayor. Steiger twice launched unsuccessful bids for governor of Arizona and also served on the staff of embattled Gov. Evan Mecham in the 1980s. SAN BERNARDINO - A San Bernardino County jury on Friday recommended a death sentence for the violent methamphetamine addict convicted of setting the catastrophic 2003 Old Fire that destroyed 1,000 homes, blackened the San Bernardino Mountains and led to five deaths. The jury in August found that Rickie Lee Fowler deliberately set the blaze by tossing a lighted road flare into brush at the base of the mountains on an October day when Southern California already was overwhelmed by wind-fed wildfires. He was convicted of murder and arson. Superior Court Judge Michael A. Smith is scheduled to sentence Fowler on Nov. 16. The judge has the legal authority to dismiss the jury's recommendation and instead sentence Fowler to life in prison without the possibility of parole, but such an action is rare in California. Smith noted that Californians on Nov. 6 will vote on a proposed ballot initiative - Proposition 34 - that, if approved, would abolish the death penalty and replace it with life in prison without the possibility of parole. SACRAMENTO - Gov. Jerry Brown on Friday vetoed a bill that would have raised the fine for illegally using a cellphone while driving in California from $20 to $30. Brown rejected the penalty increase, saying he believes the current fine is "a powerful deterrent." While the state base fine is $20, the governor noted that the total can climb to $200 or $300 with court fees. "Upping the fines may satisfy the punitive instincts of some, but I severely doubt that it will further reduce violations," the governor wrote in a message. Palo Alto Democratic Sen. Joe Simitian says his bill was intended to reduce deaths and collisions by discouraging using hand-held cellphones. Repeat violations also would have added points to drivers' records, potentially increasing their insurance costs. KNOXVILLE - The University of Tennessee has suspended a campus fraternity chapter until at least 2015 in an alleged alcohol- enema incident. The school announced Friday that the Pi Kappa Alpha house will be closed on Oct. 7 and that the campus chapter has notified the national fraternity that it is voluntarily surrendering its charter. Knoxville police said that one fraternity member was admitted to the hospital earlier this week with a dangerously high level of intoxication after receiving an alcohol enema. A dozen people were later cited for underage drinking. Alexander P. Broughton, 20, has denied that he received an alcohol enema, though police records dispute that claim. Broughton's father has said his son has recovered and returned to classes. FREDERICK - Maryland state police have charged two men with stealing 76 bronze vases from a Frederick cemetery. Christopher Wachter, 22, of Thurmont and Robert Michael Shriner Jr., 34, of Hagerstown are each charged with theft, destruction of property and destroying a funerary object. Troopers told the News-Post of Frederick that the men stole the vases between Aug. 20 and Sept. 19 from Resthaven Memorial Gardens. Authorities say the men sold the vases to a recycling center.